pseudoparanormal: OBEs: Astral Projection or Asinine Perspective? An out of body experience is usually described as having the sensation of floating outside of one's body. It can also manifest as perceiving one's self from a place outside of the body. There are different types of OBEs including: spontaneous, near/during sleep, and near death experiences. 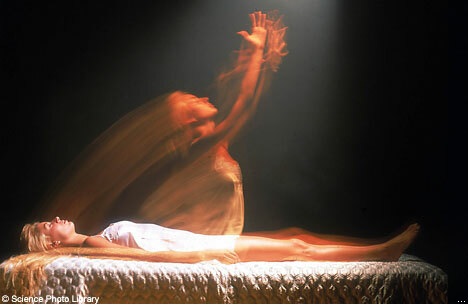 OBEs are sometimes referred to as "astral projection". Those who support the idea of astral projection believe that OBEs are the astral body's or soul's ascent to higher realms. According to paranormal.about.com, when Jerry Gross, an out-of-body teacher "wants to travel long distances, he doesn't bother with the time and expense of catching a plane. He just uses a different kind of plane, and travels there astrally." He also claims that everyone leaves their body at night during sleep, they just don't remember it when they wake up. This argument makes sense because, who truly knows what happens during their time asleep? However, this type of argument is also typical of a pseudoscience perspective because it is not testable through empirical research. Once again: Psychology, 1, pseudoscience, none. I'm also doing a post on astral projection and what I took from my reading is that the circumstances surrounding supposed astral projection often seem stressful or when someone might not be completely in control of their cognition. I read a lot of people claim to have OBEs alongside near death experiences, but logically their perception of the event could be colored by stress or interpreted differently after the fact. And as far as people claiming to have OBEs while they sleep...I just find it hard to believe it's anything more than a dream.